Three packages of Pop Rocks. Kind of retro, no? What’s that Simpsons quote? “It’s like there’s a party in my mouth, and everyone’s invited!”? That just about sums up Pop Rocks. You never forget your first experience with this exploding confection. 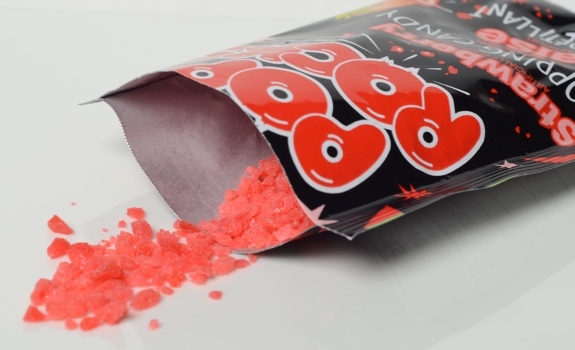 You tear open the package, throw some Pop Rocks in your hand, then pop them into your mouth. Saliva reacts with the candy, dissolving it in a way that releases little blasts of gas. It’s a snap-crackle-pop experience beyond the realm of breakfast cereals. The most creative use of Pop Rocks I’ve ever encountered was at a restaurant in Kamloops, where they rolled discs of white-chocolate cheesecake in Pop Rocks. The mouthfeel? Creamy, silky and explosive. Also, freakin’ amazing. The Look: Black packaging with bright lettering and white highlights. Rudimentary line-art fruit likely built in a 1990s copy of Illustrator. The rocks themselves are a rounded crystalline shape, in sizes that vary from dust to small nuggets the size of match heads. Tropical Punch: Sweet, with the non-medicinal notes of cherry cough drops. The illustration on the front shows pineapple, but I’m barely tasting any of that. Strawberry: The classic. Basic artificial strawberry, all sweet with no nuance. Wild Berry: Kind of like strawberry, but a bit more, uh, wild? I guess there’s some artificial raspberry/blueberry in there, if that’s what I’m tasting. One of those flavours that tastes like Wild Berry, the abstract flavouring concept, but not any actual wild berries. The Popping: As soon as I opened the package, the Pop Rocks started popping. Turns out a hot, humid apartment can have that effect on these things. If you want to get the most bang for your $0.75, put a generous pinch of Pop Rocks in your mouth all at once, then make sure there’s an ample amount of saliva to react with them. For added amplification, experiment with opening your mouth a bit, which should create a natural acoustic cave. See? You’re a kid again. 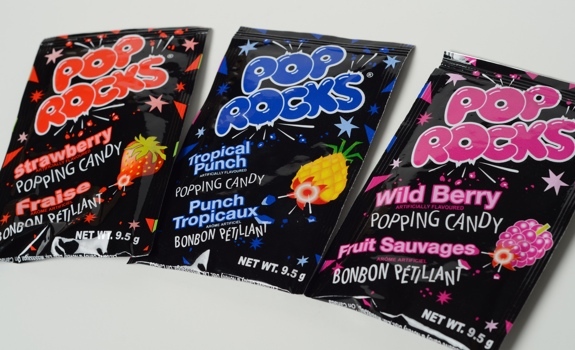 Once the packet is cut open, the Pop Rocks pour out freely. But within minutes, they pick up humidity in the air and start gumming together and sticking to the side of the package. Lesson? Eat them quickly. Cost: $0.75 per 9.5 gram pouch at Bulk Barn. Value for cash money: Good. 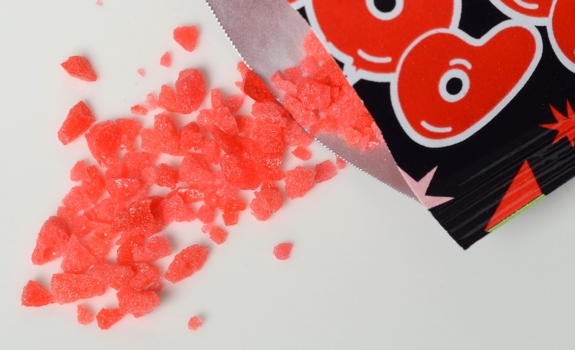 There’s not much in a pouch, but you don’t need much to have a satisfying Pop Rocks experience. Availability: Check Bulk Barn, specialty candy shops or convenience stores with a particularly good candy selection. Nutrition? : Per pack (9.5 grams): 40 calories, 0 grams of fat, 0 mg of sodium, 0 grams of fibre, 0 grams of protein. Not too many calories for a fun, funky snack. The verdict: Are they a novelty? Sure. Does everyone need to try them at least once, just for the experience? You betcha. Pop Rocks! The first ones to come out of the pack are these large, pretty nuggets. They explode real good, like.